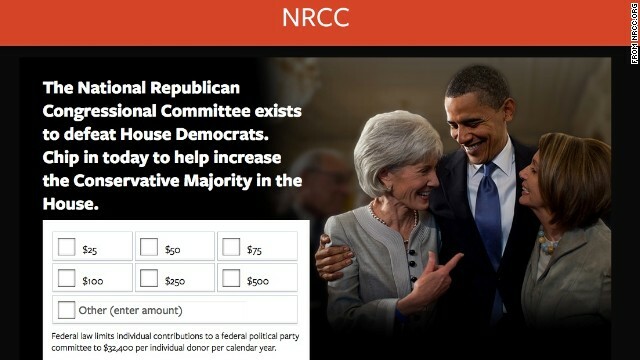 Washington (CNN) – The National Republican group whose mission is to elect GOP House members has altered some of its misleading websites for 2014 congressional candidates, making it more clear that any contributions made through the sites will be going toward defeating Democrats, not supporting them. CNN Special Investigations Correspondent Drew Griffin featured the National Republican Congressional Committee’s strategy earlier this month. At least 15 websites that appear to be official campaign sites for Democratic candidates are actually run by the National Republican Congressional Committee. The website changes come after Griffin interviewed one donor who thought he was contributing to Democratic Rep. John Barrow when he clicked a big, blue “donate” button on a site that looked like it was made by the Georgia congressman’s campaign. The URL read: johnbarrow2014.com. Randy Frails, the donor, contributed $1,000 through the website, only to soon realize it was actually a site created to challenge Barrow. He didn’t see the smaller print that stated the money would go toward defeating the Democratic incumbent or the tiny disclosure at the bottom that the website was paid for by the NRCC. Frails was able to get his money back, but the John Barrow website is one of many that uses the image of the candidate in a positive light, not the kind of image seen in attack ads. It appears at first glance to be supportive of the candidate. The home page portion of these websites still remains online, including the disclosure, but the contribution page has changed. For example, the big “donate” button on the John Barrow website takes donors to a new page, one that looks distinctly different from the John Barrow website and explicitly states the NRCC’s name at the top. “The National Republican Congressional Committee exists to defeat House Democrats. Chip in today to help increase the Conservative Majority in the House,” the page reads. Here’s an example of the old shot of a contribution page for Democratic candidate Alex Sink in Florida. The donate button now takes donors to the new page. Scarpinato confirmed Sunday the group had changed the donation portal on the websites. "We recently updated our contribution pages, as we frequently do, to highlight our efforts to defeat House Democrats in 2014 and prevent Nancy Pelosi from ever being Speaker of the House again,” he said in an e-mail. A photo of President Barack Obama, House Minority Leader Nancy Pelosi and Health and Human Services Secretary Kathleen Sebelius - who are all smiling - is also displayed at the top of the new contribution page. Sure bet; Karl Rove's prints are all over this ad... and paid by the Koch brothers. Jay, did Obama say that you will be able to keep your doctor/health care plan at the same price, period? Insurance companies offer illegal plans for 3 years, then complained that they had to cancel the plans. All insurance companies had to do was to keep/grandfather their 2010 plans, then the plans would have been legal. Obamacare's requirements do not apply to grandfathered plans. But insurance companies decided to scrap their 2010 plans. They offered new plans that they knew would not comply with the new law, instead of keeping their old plans which would have been legal. It was their own choice. Less misleading is still fraud. It's the only tactic the GOP has left. Pretty telling. I still wonder for all the people who think about voting for the Republicans this Fall what do they expect the Republicans will do better? Will they create jobs? How? Will they improve the ACA? or, will they take it away? @MTATL67 – You are kidding, right.....recall You can keep your plan? Do you recall it was a spontaneous uprising over a youtube video? The real proof will be in November – prepare to be disappointed. Hmmmm..... Not surprising at all really. They're only doing this because of the bad press. What a dirty trick to even consider using in the first place. Typical Republican dirty politics. Randy Neugebauer, for instance, is running ads claiming Obamacare's website still doesn't work and that your personal information is susceptible to hackers. The first hasn't been true in a while, and the second was never true to begin with.